"The Sixties." The powerful images conveyed by those two words have become an enduring part of American cultural and political history. But where did Sixties radicalism come from? Who planted the intellectual seeds that brought it into being? 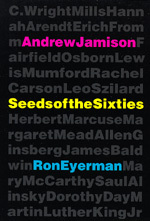 These questions are answered with striking clarity in Andrew Jamison and Ron Eyerman's book. The result is a combination of history and biography that vividly portrays an entire culture in transition. The authors focus on specific individuals, each of whom in his or her distinctive way carried the ideas of the 1930s into the decades after World War II, and each of whom shared in inventing a new kind of intellectual partisanship. They begin with C. Wright Mills, Hannah Arendt, and Erich Fromm and show how their work linked the "old left" of the Thirties to the "new left" of the Sixties. Lewis Mumford, Rachel Carson, and Fairfield Osborn laid the groundwork for environmental activism; Herbert Marcuse, Margaret Mead, and Leo Szilard articulated opposition to the postwar "scientific-technological state." Alternatives to mass culture were proposed by Allen Ginsberg, James Baldwin, and Mary McCarthy; and Saul Alinsky, Dorothy Day, and Martin Luther King, Jr., made politics personal. This is an unusual book, written with an intimacy that brings to life both intellect and emotion. The portraits featured here clearly demonstrate that the transforming radicalism of the Sixties grew from the legacy of an earlier generation of thinkers. With a deep awareness of the historical trends in American culture, the authors show us the continuing relevance these partisan intellectuals have for our own age. Andrew Jamison and Ron Eyerman are American scholars at Lund University in Sweden. They have published two books together, The Making of the New Environmental Consciousness (1990) and Social Movements: A Cognitive Approach (1991). Ron Eyerman is also an editor of Intellectuals, Universities, and the State in Western Modern Societies (California, 1987).